Immuno Powder - 7 oz. 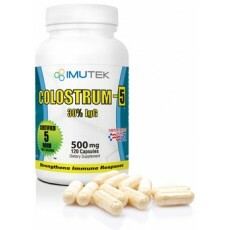 ImuTek Colostrum-5 Capsules and Powder contains the finest colostrum available on the market today. It is pure 100% all natural bovine colostrum, certified harvested within the first 5 hours of milking from US Grade A Dairies. Our colostrum is low heat processed and rigorously tested to ensure it maintains all the benefits of the IgG complex. Colostrum-5 is also free from pesticides, antibiotics and artificial hormones. * These statements have not been evaluated by the FDA. This product is not intended to diagnose, treat, cure, or prevent any disease. Consult your physician before using this or any other product.